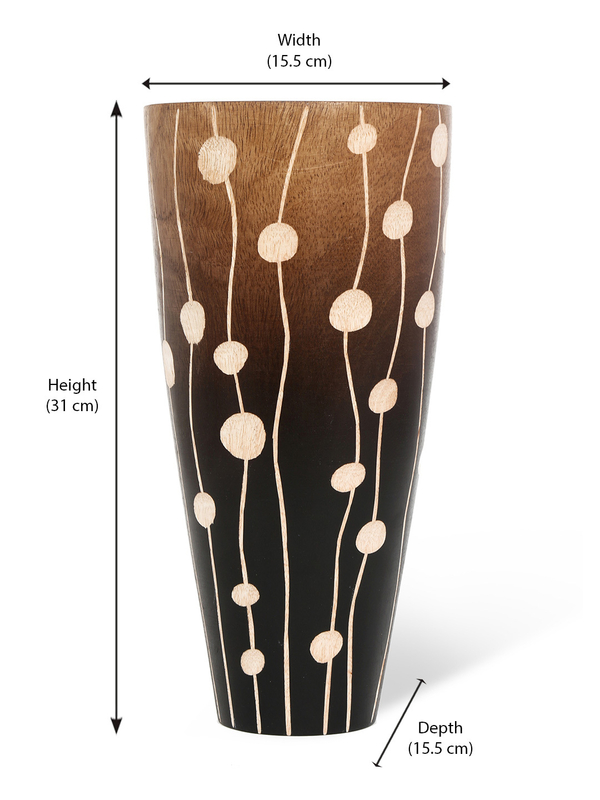 This wooden vase gives a natural look and is made out of premium quality wood. It is a wonderful piece of art and is covered with white dots connected with the help of white curved lines. This pattern is unique and rare and gives the vase a new and fresh appearance. The curves are subtle and provides a minimalist outlook to the space wherever it is installed. The vase fits itself in all kinds of decor and the curves also add grace to the wooden surface. The woody vase is an organic creation and supports its customers across the complete lifecycle of the asset. The vase gives a natural look to your home and can be further beautified by placing bunch of flowers in it. The piece wraps in itself the expertise of highly knowledgeable craftsperson. This twilight wooden vase is the gift for your beloved people during special occasions such as marriages, birthdays or festivities. A perfect Christmas and valentine day gift as your significant other can embrace their house with this wooden vase’s beauty a lifetime. Made out of natural ingredients the vase holds itself capable of decorating all corners of the room and bringing to life all dull spaces of the living area. It is a stylish and fashionable escape to make your house look appealing and accented. This uniquely crafted wooden vase is the decoration you need for your homes and office table desks. These can be availed from @Home, a one-stop solution for home decor products.